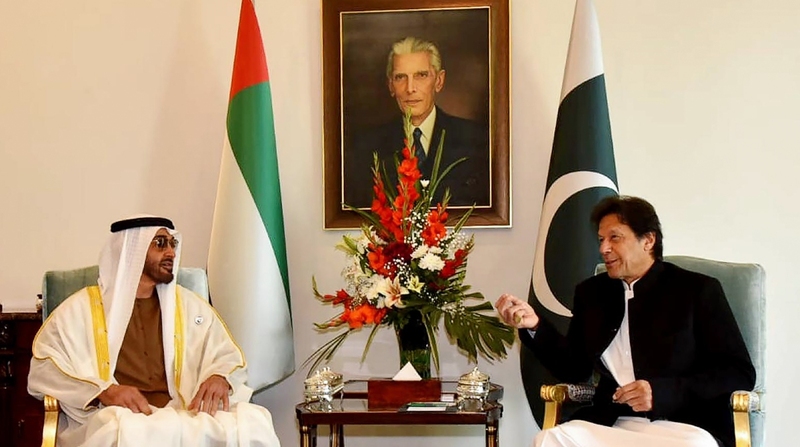 Pakistani Prime Minister Imran Khan and Crown Prince of Abu Dhabi and Deputy Supreme Commander of the United Arab Emirates’ Armed Forces Sheikh Mohammed bin Zayed Al Nahyan have agreed to work jointly for peace and stability in Afghanistan. The two leaders on Sunday held talks here on bilateral matters and strongly condemned terrorism in all its forms and manifestations, and expressed their resolve to work closely to root out the scourge, said a joint statement issued at the conclusion of the visit of Sheikh Mohammed, Xinhua reported. “The Crown Prince recognised the efforts and unparalleled sacrifices made by Pakistan to eliminate terrorism and extremism,” the statement said. The two leaders agreed to work closely for the lasting peace and stability of Afghanistan. The UAE hosted Pakistan-facilitated talks between the Taliban and US officials in Abu Dhabi weeks ago. The two sides also agreed to explore further collaboration in areas of training, joint exercises and defence production. Sheikh Mohammed visited Pakistan following the UAE’s announcement of $3-billion support to Pakistan. In return, Pakistan welcomed the UAE’s investment in its oil and gas, logistics, ports and construction sectors.